As we enter into the Lenten season with an eye to Good Friday, some of us may be wondering: How do I help my congregation understand the cross in the context of God’s larger story? Derek Vreeland has a new book recently released, N.T. Wright and the Revolutionary Cross, a reader’s guide to N.T. Wright’s book The Day the Revolution Began. We sat down with Derek recently to talk about his book and explore how the cross leads us into hopeful mission. 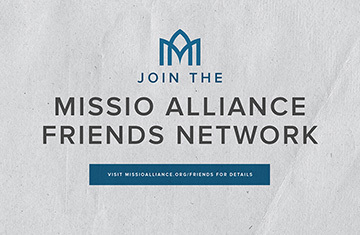 Missio Alliance: Derek, give us a look behind the scenes. What made you want to write this book? I wrote this book to help people catch of glimpse of Wright’s theological vision. My two atonement articles this summer for Missio Alliance (“Is Penal Substitutionary Atonement Necessary?” and “Is the Cross Even Necessary?“) grew out of my work in this book. Missio Alliance: Why is Wright’s theology so important for us today? How is it a “game changer,” as you say? Derek: Evangelicalism has been wrestling for some time to articulate a clear understanding of how the cross saves us. One branch on this family tree has argued strongly for penal substitution as the definitive theory for an evangelical understanding of atonement. Some have even gone so far as to equate penal substitution with the gospel, arguing that if a person denies penal substitution then they deny the gospel! Wright clearly demonstrates that the idea that Jesus died to satisfy the wrath of God does not fit into the big story the Bible is telling. Wright is at his best when he grounds Christian doctrine in the grand narrative of Scripture. I took the time to write this reader’s guide to help people access Wright’s theological point of view, one built on historically-grounded exegesis. Wright is so important because he does his best work for the church to empower the church for her mission of making disciples of the nations. Missio: Some of our readers may not understand what a “reader’s guide” is for. Is your book just a summary of Wright’s book? Derek: It includes a summary, but it also contains a lot of my own interpretation of Wright. I tried to write a straightforward summary in Through the Eyes of N.T. Wright. In this new book, I included more of my own reflection and interpretation. I have been reading Wright for nearly ten years and I have grown comfortable enough with his primary themes that I felt confident in adding some of my own thoughts in this book without drawing anything away from Wright’s primary points. Also, I am confident that if people only read my book they will grasp the primary themes of Wright’s book. Of course, I’d still suggest reading both together. In a reader’s guide there is no way to summarize all the content from Wright. Some things will be left out. My book provides a good summary that will help someone before reading Wright’s book, and I also provide reflection questions at the end of each chapter that can be used for personal or small group study. Missio: Lots of books have been written on the cross. What makes your book and Wright’s book different? Derek: The subject of atonement is a hot topic right now and there are many books written about it, but a number of them are written from a systematic or dogmatic perspective. From my experience people tend to talk about atonement as a theological doctrine cobbled together from various verses of Scripture drawn primarily from Paul. Wright approaches the atonement from the perspective of a biblical theologian. He turns up the volume on all the biblical writers, most importantly the gospel writers, so we can hear what they each have to say about the death of Jesus and its meaning for the church and the world. Missio: And what is it that we hear about the cross when we listen to each of the gospel writers? Derek: We come to find that the death of Jesus was nothing less than the reverberating explosion of a world-wide and world-saving revolution. The modern American evangelical emphasis on the cross has been that Jesus has died for my sins to save me and take me to heaven when I die. From this vantage point, the cross is about saving us from personal sins, leaving big systems of sin untouched. The gospel writers show us that the political and religious power brokers of their day colluded together to execute the Jewish Messiah, but in actuality, Jesus’ death overcomes the love of power by the power of love. Jesus’ words from the cross—“Father forgive”—sends shock waves through the systems of economic, social, and political corruption and sin. Missio: Some people may be afraid that speaking of the cross in this revolutionary way ignores the personal benefits of the cross. Do you agree? Derek: Not at all. In Christ, and through his death, God is reconciling the world to himself. God is rescuing and repairing the world he loves, which starts by rescuing and repairing individuals within his world. This larger, more revolutionary view of the cross does not remove any of the personal accomplishments for us who are in Christ. It just puts our personal experience with the cross in a larger context. If God is going to set right a world gone wrong, then he needs to first set right his image-bearing creatures. So yes, we are each forgiven of our personal sins, but the reach of the cross extends beyond that. Missio: What’s so dangerous about having this limited view of the cross? How does it influence us and how we see God in ways we may not understand? Derek: Wright discusses a three-fold mistake. First, he argues we have Platonized our eschatology, assuming Jesus died to take us to heaven. Second, we have moralized our anthropology, assuming God created us to keep the rules. And finally, we have paganized our soteriology, assuming Jesus’ death satisfies God’s wrath. These three mistakes prevent us from seeing the big story the Bible is telling. The Scripture does not tell the story of an angry God handing out rules and killing his Son to pacify his moral anger at the moral failure of his people. The Bible tells the story of creation and the corruption of human sin, followed by covenant, God’s answer to human corruption. God’s covenant, particularly with Abraham, is fulfilled in Christ who brings God’s new creation. Jesus’ death is the beginning of the unfolding of new creation. Missio: Amen! Thanks for taking the time to talk with us, Derek, and for offering the fruits of your study to the church. We hope all our readers will check out Derek’s new book, N.T. Wright and the Revolutionary Cross, available now on Amazon. Words of Terror: "Dad, I'm in love..."